Albert Einstein is credited with having said that “Everything is energy and that’s all there is to it. Match the frequency of the reality you want, and you cannot help but get that reality“. Whether or not Einstein actually said that, one of the underlying truths of the statement is that everything is vibration and so everything has a frequency. Matter is not inert, it vibrates in relation to the electrons that circulate around atoms. You could say that people, who are made of matter, also vibrate. The most extraordinary vibration that we all are familiar with is music, which consists of a set of harmonious sounds (i.e. vibrations). It is based on these reflections that Sound Healing, or all those activities that use sound vibrations to induce a sense of wellbeing, has become a popular practice in the West. Eastern culture, instead, has long been acquainted with the healing power of sounds, starting from the so-called primordial sound, the Ohm, which is one of the most popular mantras. Christian tradition also has its own version of primordial mantra, as the Gospel of John (John 1:1) reads: “In the beginning was the Word, and the Word was with God, and the Word was God”, as if to signify that the creation itself took place thanks to sound. Regardless of one’s religious or philosophical beliefs, there are common elements of experience that make us realise how sound affects moods. For example, just think of the “sinister” music used as the soundtrack to horror movies. That kind of music consists of dissonant harmonies that generate a psychological state of tension because of the (extremely unique) combination of the different frequencies of the tones chosen. 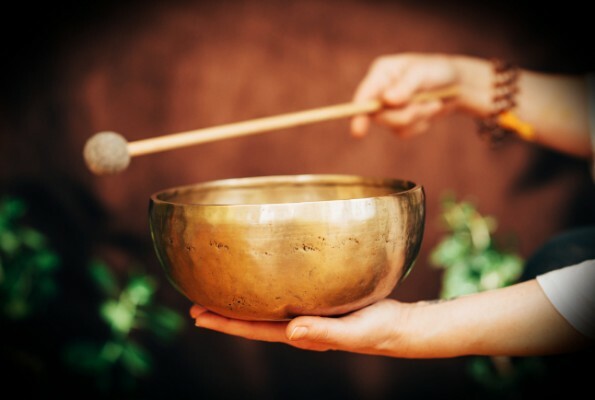 In Sound Healing, vibrations are believed to affect bodily vibrations, stimulating healing processes and generating specific psychological states. An example? When we are stressed, immersed in our everyday routine, the brain emits so-called “Beta waves” that range between 14 and 30 Hz. Based on the physical principle of resonance, a sound that has minor frequencies (for example, a singing bowl that emits frequencies around 8 Hz) “leads” the brain to change its frequency, exiting the Beta state to shift to calmer states (for example, the Alpha state, in which the brain waves are between to 8-13 Hz). Dissonant sounds, industrial noise, the rumble of engines and other similar sounds, on the contrary, generate anxiety and agitation. In a world where silence struggles to find any room, it is easy to understand why Sound Healing is finding advocates everywhere. All this occurs, as mentioned, because of the principle of resonance, which is easy to understand when we take a look at this example. Good vibrations are transmitted and become contagious! After a night on a superior-quality mattress, everyone can spread good vibes. All that’s left now is to try!